In my 2016 preview for the New York Yankees, I stated that the Bronx Bombers would finish in third place in the American League East with 84 victories. With a few lucky breaks, the Yanks could hit 90 wins and possibly take the division title. The five teams in the East are all pretty evenly matched which stands to reason with a few unlucky bounces, New York could finish in the cellar. Nevertheless, the Yankees continue their retooling/rebuilding on the fly as they will remain competitive unlike most teams that have done a full rebuild such as the Philadelphia Phillies and New York Mets. It’s time to go out on a limb and make predictions on five Bronx Bombers for the 2016 campaign. 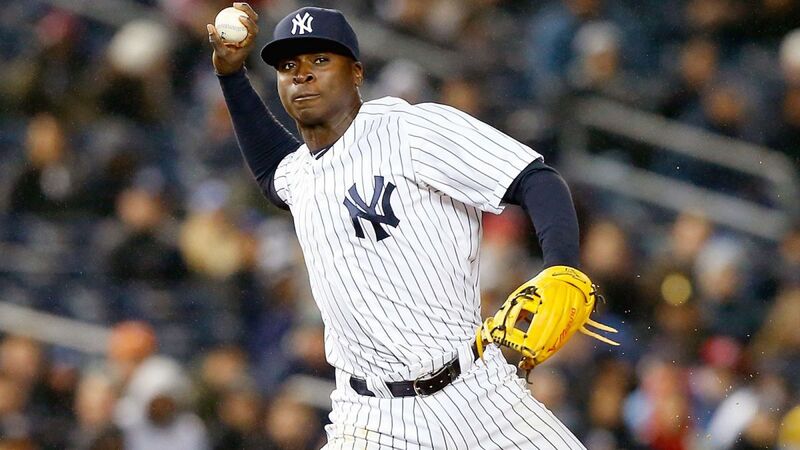 Didi Gregorius will be even better in Year Two. You come into New York and try replacing Derek Jeter. That is exactly what Gregorius was asked to do and to no one’s surprise, he struggled early in the season. It seemed as though the whispers about a weak bat were coming to fruition and he was uncommonly sloppy in the field. However, starting in July, Gregorius emerged as one of the Yanks’ better players as he hit .315 in July and August with an on-base percentage of .359. He’ll never be confused with Jeter as an offensive force but he won’t be asked to assume such a role. Although he can stand to improve the overall .318 OBP, Gregorius will still be enough of a presence that pitchers can’t ignore him. After hitting nine home runs in 2015, expect the 26-year old to slug between 12 and 15 and hit around .270. As long as he remains a spectacular defender, this acquisition will go down as one of Brian Cashman’s best over the past decade. There will be no repeat performance from Alex Rodriguez. Despite his recent will he or won’t retirement announcement, 2016 will be much different than 2015 was for Rodriguez. The sequel will not be anything close to the original. The year-long suspension did wonders for Rodriguez for both his body and his mind. However, once the euphoria wore off (and it did take a while), his numbers reflected that of a guy whose career is almost ready to come to a close. Though he hit nine homers over the final two months of the campaign, Rodriguez batted a dreadful .189 in that span. The fact of the matter is he is now a 40-year old man who has played 21 seasons of Major League Baseball. He hit 33 HR’s and drove in 86 runs a year ago. Can he still be effective? Sure, for short stretches at a time. However, he’ll be lucky if he hits half the dingers he totaled last season with roughly the same .250 batting average he ended up with. Masahiro Tanaka will win 16 or more games. This is about as out-on-a-limb as it gets. There is nothing over his first two Major League seasons that even suggest Tanaka will make enough starts to win 16 games. However, when healthy, he has the ability to dominate such as last September 13th when he shut out the high-powered Toronto Blue Jays’ offense for seven innings, allowing only four hits. The 27-year old Tanaka has made only 44 starts during his first two seasons in Pinstripes with a partial tear in his pitching elbow ending his 2104 season and a strained forearm that interrupted his 2015 campaign. There is a reason why New York spent $155 million dollars on Tanaka and that is the belief that his overwhelming success in Japan can be duplicated here. We have only seen it in spurts the last two years. In 2016, he puts it all together and becomes a top-10 pitcher in the American League. Carlos Beltran will not play in more than 105 games. He was the Yankees’ best player over the final two months of 2015, batting .305 with 11 home runs. However, the odds of Beltran putting together consecutive, relatively injury-free seasons a his age (he’ll turn 39 on April 24th) are long indeed. Beltran is expected to get the nod in right field every day but there is no DH spot for him to fall back on as that is the domain of Rodriguez. Of course, given that Beltran is actually younger than him the possibility exists that Rodriguez will see time on the disabled list with Beltran sliding into his spot. In 2014, Beltran played in 109 games while appearing in 133 last season. It’s hard to imagine him playing in as many contests in 2016. He dealt with an oblique issue last year and a bone spur two years ago. Too much mileage and too many injuries means this will be a season in which Beltran struggles to hit triple digits in games played. Mark Teixeira will be the Yankees’ Most Valuable Player. There is something about a player entering the final year of his contract that brings out the best in him. Teixeira is in the final year of his long-term long deal with the Yankees and with Greg Bird looming on the horizon (despite him about to miss the entire season) he will most assuredly be playing his final season in the Bronx. He clubbed 31 home runs and was an All-Star last year before a freak shin injury shut him down for good late in the year. Teixeira is another guy who has not been able to avoid the DL in recent seasons but at age 36, he feels as though he has another five seasons left. He is still a great glove in the field and if he can hit like he did in 2015, there will be some team, particularly in the American League that would feel safe in giving him a two or three-year contract. This is why his potential final season as a Yankee will be a really good one.